If you have a few days to spend at Eilat area, so we definitely think you should read this article. 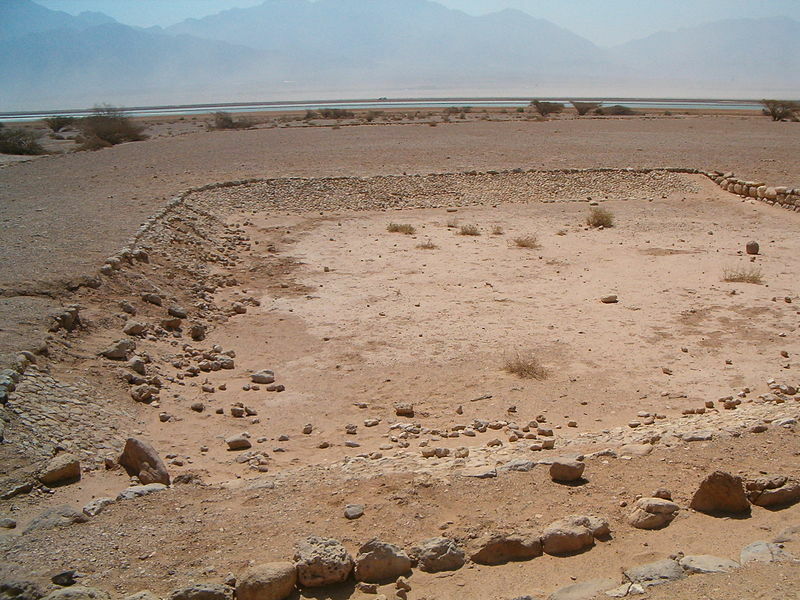 Since Eilat is located in the southern point of Israel, it is pretty rare to travel in this area, and even the Israelis are not familiar with the area. So if you already here (or you just plan to visit), don't be lazy, leave the pool and go travel in one of the most special places in Israel. Route by - Eilat County team from the National Parks and Parks Authority. We start our route with a visit to the wildlife nature reserve of Yotva'ta, which is 35 kilometers north of the city of Eilat. The entrance to the reserve is across from kibbutz Samer. In the reserve you may stroll across the "Predators Center" where you can see all the caged animals (caged for a reason…); the reptiles, the night creatures of the desert and many more. You may also visit a dark room filled with bats and scorpions. When we go outside we can enjoy the vegetarian animals, such as: rams, deer, stallions and a whole lot more. The route is under the caped sky – driving in your car while completely accompanied by 100 percent guidance. 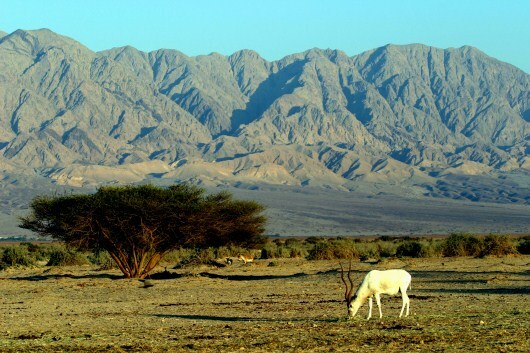 From the wildlife in Yotva'ta we continue south (left) towards Eilat. We drive until we reach the Evrona wilderness. The entrance is approximately 4 kilometers south of Be'er- Ora junction. We get off the highway to a gravel road. The Evrona wilderness is a nature reserve with a large concentration of acacia trees and more than 200 deers. Please drive slowly and carefully, in order to not disturb the deer activity in the area, you do this by not diverting from the marked path. After approximately 2 kilometers, we head south (right) and after 200 meters we arrive at Be'er- Evrona which is a well. We continue a bit more south to a unique salt utilizing facility and after 3 kilometers driving south we find the world's largest concentration of Dom palm trees. We continue south on the dirt road and reach the north-west corner of the salt lakes. We peek over the poolside and see loads of ocean birds, flamingo's grey and pink, ducks and many more. We continue a kilometer south and then turn west (right) to the dirt road which takes us back to the main highway (the Arava) in the Nahal Amram junction. From here we go towards Amram Pillars. To the Amram Pillars we drive the gravel road for about 3 kilometers until Katzaa junction (the Eilat- Ashkelon pipeline) and turn right at the T junction in the blue marked path. And here we have entered the Eilat Mountains nature reserve. There is no littering throughout the duration of the route. From the Katzaa junction we continue 4 kilometers, through the colorful mountains of the Amram Hills, the road ends at a parking lot, and there is no usage of fire in the parking lot! From here we use the black marked path on foot (500 meters) until the Amram Pillars. We go back the same way on the main highway, head south towards Eilat, pass the city entrance and the "tourist square" heading south finding some where to park. Amram Pillars. Credit - Dafna Tal. 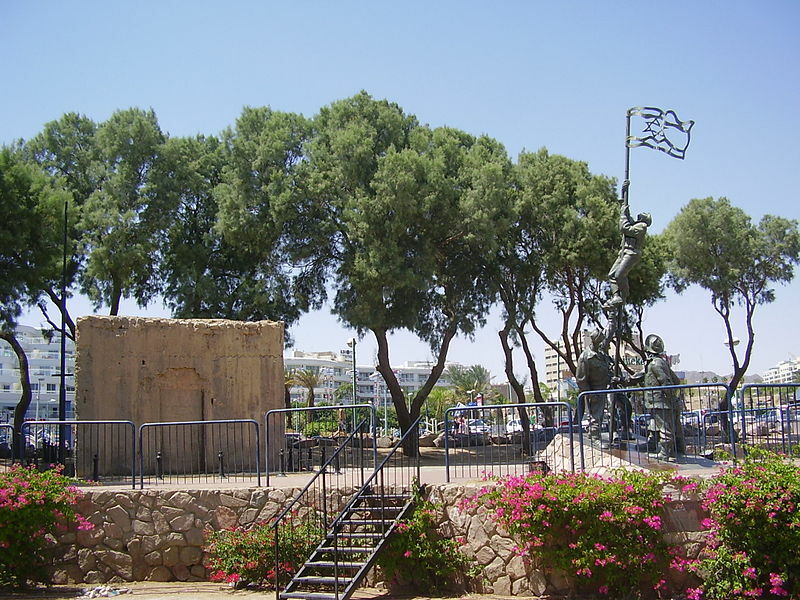 In adjacent to "Mul-Hayam" shopping center hides the site "Um Rash Rash"- this site is a national historic site, where the "ink flag" was raised by the soldiers of the Negev brigade. After the petrol docks (placed at sea), we head west (right) to Shlomo stream. 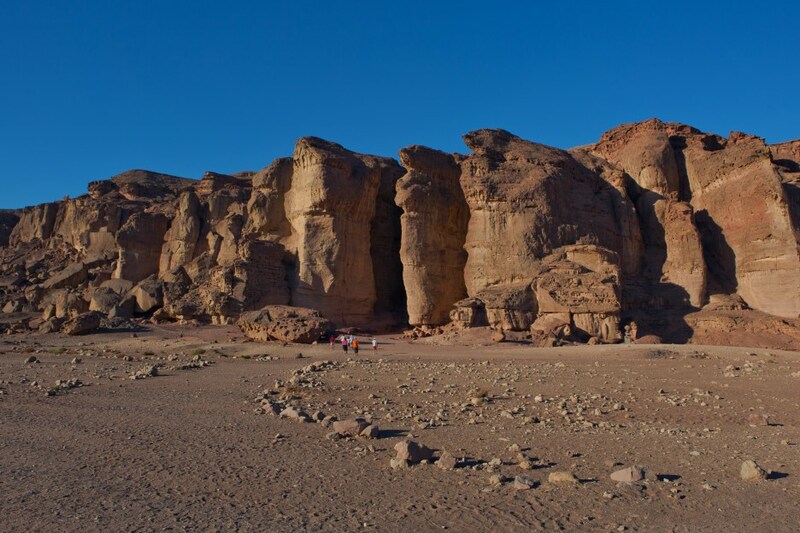 At this place we are joined by a road leading us to the southern part of the Eilat Mountains nature reserve, 3 kilometers south of that we reach the Almog beach nature reserve. The underwater observatory stretches from the Almog beach all the way to Taba in the half island of Sinai. At the reserve you may rent a snorkel and diving mask, and watch the wide variety of coral fish and reef life, hitting or even touching the coral is strictly prohibited and also very dangerous- not just for the coral but also for the visitors.